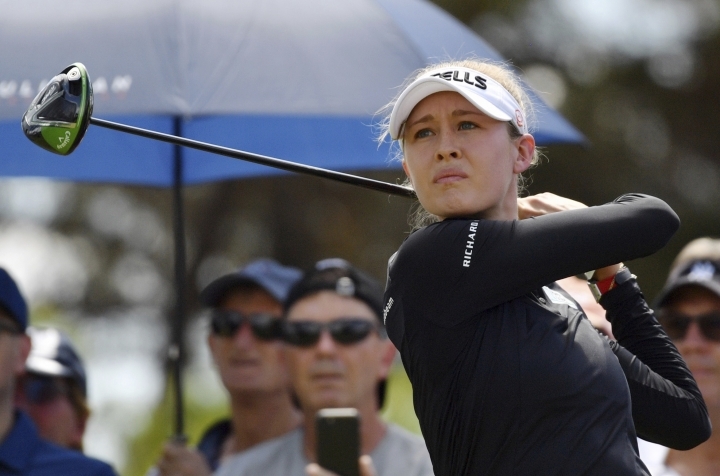 ADELAIDE, Australia — Nelly Korda added to her family's impressive sports pedigree Down Under with a win Sunday in the Women's Australian Open. She had a third consecutive birdie on the 12th to help claim a two-stroke victory with a 5-under 67 at The Grange Golf Club, finishing with a 17-under total of 271. Defending champion Jin Young Ko was second after a 64. "I just got off the phone with my dad and he's like 'well, congratulations, you're part of the Korda Slam now'." Petr and mother Regina, also a pro tennis player who represented Czechoslovakia at the 1988 Olympics, watched their daughter's triumph from their home on the west coast of Florida. Jessica, currently sidelined from the LPGA Tour because of a wrist injury, watched from Florida's east coast. And Sebastian tuned in from Turkey moments before he played a Futures Tour match. 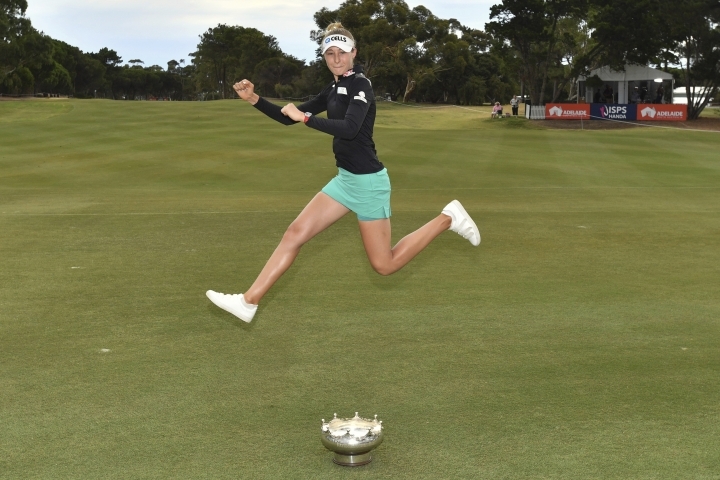 "When I was left out (of winning in Australia) they didn't try to rub it in too much," Nelly Korda said. "Now that we all have a win down here, it's going to be really special ... obviously there was pressure but I think I finally carved my own way." The Women's Australian Open tweeted before the final round began a photo collage of Petr, Jessica and Sebastian doing what they called the "Korda Kick" — actually a scissor kick — after winning each of their titles, and adding that they hoped they hadn't jinxed Nelly. And sure enough, keeping it in the family, Nelly was photographed doing a scissor kick after the trophy presentations. Jessica Korda tweeted to her 81,500 followers just before Nelly made the turn at The Grange, at about 11:30 p.m on the East Coast of the U.S: "Who else is staying up with me?" Jessica's first reply came from someone who said "we might be needing a quadruple Korda-Jump picture." "I couldn't really hear what she was saying, she was screaming so much," Nelly Korda said.